Amazing writing. Evolving characters. Engaging plot twists. This is how I summarize Sarah Negovetich’s debut novel, Rite of Rejection. SUMMARY: Straight-laced, sixteen-year-old Rebecca can’t wait for her Acceptance. A fancy ball, eligible bachelors, and her debut as an official member of society. Instead, the Machine rejects Rebecca. Labeled as a future criminal, she’s shipped off to a life sentence in a lawless penal colony. First, I loved the premise of the book–a future society uses a machine to predict a person’s tendencies while still a teen, to weed out people who will harm the society in the future. I’d not seen such an idea explored and it’s pretty scary if you really think about it. There were five primary characters–Rebecca, Eric, Elizabeth, Daniel, and Molly. While I felt Molly wasn’t well developed, the author did a good job at evolving the others, particularly the main protagonist, Rebecca, from a naive sixteen-year-old who wouldn’t think of hurting a flea, into a character resolved to sacrifice herself in order to change society. That’s quite a span to bridge but I thought Negovetich did it in a way that was believable, even including Becca’s first true love, with all the challenges that holds, in the process. That said, the plot felt too predictable for the first half of the book. Kids are sent to the PIT (a prison-like facility) because a machine predicts they will become criminals in the future. Enter sixteen-year-old Rebecca who, despite how unlikely it seems, gets sent to PIT. Of course the first half of the book is about how she and her compatriots try to break out…which is of course foiled. IMO the book shines after this, and Negovetich’s brilliance is revealed for she takes Rebecca and her adoptive family of other teenage PIT convicts (Elizabeth and Daniel) and plants for them the opportunity to make a statement about what society outside the PIT walls doesn’t know. In so doing, Rebecca is set up as the agent of change. One complaint I had was the plot shift with Eric betraying the group seemed a bit sudden and I felt like it came out of the blue without enough lead in to make the moment more gripping. I feel like if the author had developed that a bit more, I would have felt personally betrayed and livid at the guy. But I came away from it as more of a fact that Rebecca and friends must deal with but not feeling it myself–it was more a surprise in an academic sense than experientially. Overall, this was a great first novel by a debut author! If I could have had such a strong start…LOL! Look for Negovetich to refine her storytelling and become a force. 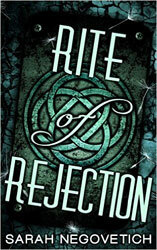 If you like dystopian with a hint of romance thrown in, I think you’ll enjoy Rite of Rejection. I give it 4.25 stars! IF YOU ENJOYED THIS POST, be sure to leave a comment to let me know what you thought and then scroll to the top of this page and sign up to be notified the instant a new post goes live. Next Next post: Dragon’s Revenge Cover Reveal!